The listing contract has changed significantly in the 40 years since we last sold. Do you have advice on the contract itself? The listing contract is an employment contract and of utmost importance. Ensuring it is the main topic of conversation can work to your advantage. Reader Question: We are interviewing agents to sell our home but have not decided on one. We know real estate is more complicated than forty years ago. Do you have any advice regarding the listing contract itself? Tony W.
Monty’s Answer: The listing agreement is a legal contract that lays out a roadmap of both parties obligations and responsibilities when selling a home. There are a number of actions to employ to leverage the event to work toward your advantage . The parties to the contract – identify the participants. Identification of the property – the property to sell. Listed price – establish the price. Term of contract – start and end date of enforceability. Protected buyers – fee is due when a pre-expiration customer purchases for a limited period after contract expiration. Seller warranty – warrants no defects or disclose known defects. Brokers obligations – the work, tools and effort the company agrees to put forth to produce a buyer. Broker cooperation – broker agrees to offer compensation to outside agents. Fixtures and personal property – included and excluded items sold with the property. Legal compliance disclosures – agency, lead-based paint, fair housing and more. Broker remuneration – the amount and conditions under which fees are due. Terms of sale – occupancy, earnest money, post-closing rent and more. Document delivery – methods and compliance timelines. Agency choices – seller direction to broker when negotiations begin. Earnest money – how to manage deposits. Seller cooperation – disclosures, showings, “ as is ” sales and more. Deadlines and rescission rights – implications of timing issues. Disclosure of material adverse facts – treat all parties fairly. Right to cure – seller choices on inspection results. Termination of listing – understanding parties timing, rights and obligations. State by state philosophies and protocols do not match up. The state laws in which your property is located applies. There are several reasons reading and understanding the proposed agreement days before the signing will affect the quality of your future decision making. 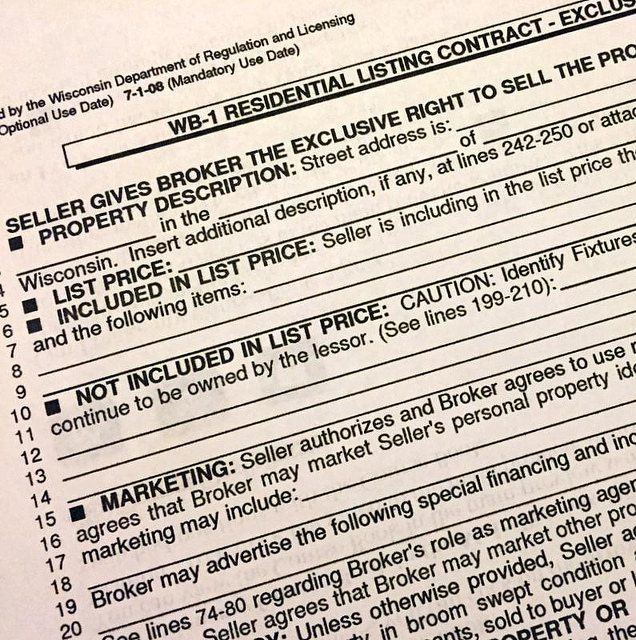 The seller lists with one company through the “listing agent.” The listing contract spells out the broker’s agreement to cooperate with other brokers and their agents to gain more exposure to the home. When the sale results through the efforts of one of the cooperating companies, this is called a co-op sale. The listing company in most markets obtains the buyer less than fifty percent of the time, so co-op sales are an important part of the selling process. Include the property in the MLS system from the beginning of the listing. Agents that promote or seek “pocket listings” have a conflict of interest as their earnings rise with a “pocket” buyer as your property’s market exposure decreases. If an agent succeeds with a pocket listing, a question you will never know the answer to is; were other buyers in the marketplace willing to pay more? Request a copy of the contract and read it prior to meeting with agents. You gain time to focus on the wording of the agreement itself, a scenario that rarely plays out in the listing presentations. Listing presentations are mainly about why the presenting agent is the right choice. They also use comparable sales information to explain market conditions in your neighborhood and the best tactics in your circumstances to maximize the home’s value. Write your questions during your early read and ask those questions during the interview. Paying attention to the agent’s reaction and responses provides insights to their view on the importance of reviewing documents. Their willingness to set aside time to review the listing documents and correctly answer your questions prior to entering a listing agreement speak volumes. Observing this particular behavior may be a critical indicator of the service level you can expect. Real estate myths have circulated for generations. There may be more armchair quarterbacks in this venue than football. The most important issues in placing your home on the market are agent selection and proper pricing. A discussion with prospective agents of the listing agreement and its implications will help make the best choice.